When Dr. Kenneth Canzoneri started our practice, he had one simple goal in mind: to combine the latest and most state-of-the-art techniques with old-school friendly service. So many offices tend to make you choose between one or the other—they either lack a personal touch or force you to run all over town with referrals. With Dr. Canzoneri and our team, you get everything in one convenient location. Starting at your very first appointment, your voice will be heard, and your experience will be completely customized to meet your unique needs and personality. And, it will all happen in a calm and relaxing spa-like environment that will ensure every time you leave us, not only will your smile feel renewed, but your entire body as well. 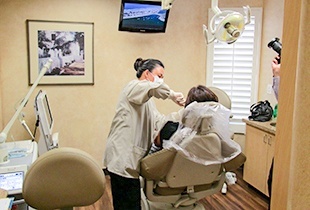 With us, we’ll actually make you feel more energized after going to the dentist! To come experience a different kind of dentistry that is solely focused on you and what you deserve, give us a call today.